We recently had some new software installed on our computers and someone reset authentication codes through Zoho by accident. How can we reconnect our Jotform integration into Zoho without having to re-do the entire configuration? Our integration is a bit complicated and would prefer just updating the authentication code/Ticket ID. 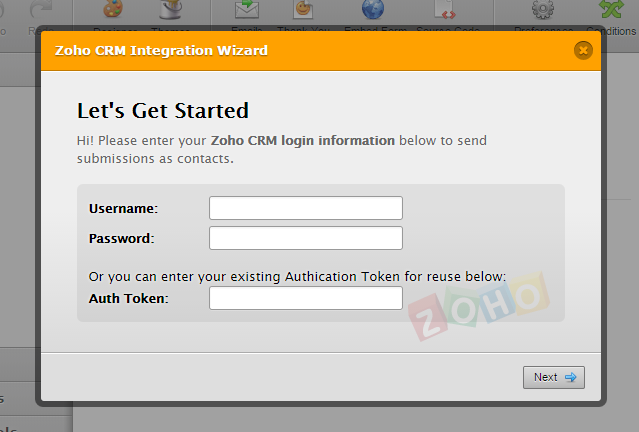 When I click on My Integrations, it says that Zoho and Jotform are connected, but when I click on "next" it says, "Invalid Ticket ID." How can we fix this? Unfortunately, you'll need to remove the integration and integrate again. But I see that you can use the existing Authentication token that you have for reuse. I'm not sure if what was reset in your Zoho account, if it's a ticket ID or the authentication token, if it's the token, I believe you need to remove and reintegrate again, this is because the token is the main code you use to identify that specific integration on that app, aside from using the log in credentials. Thanks for the response. Is there any way for us to be able to at least SEE the old integration? It was very involved, with a lot of rules/exceptions, and if I have to re-create I'll need to make sure I put them all back in correctly. Unfortunately it is not possible in your end and in mine, but I could request it to our developers, they might have a way of updating the auth token without removing the integration, possible a manual update at the back end. But, I can't guarantee that this is possible because this is quite unlikely for app integrations. We'll update you if we can work on something.